The Silver Spoon, began as a tea room and gourmet food shop 15 years ago. It seems like a lifetime ago, when I used to wake every morning and make dainty sandwiches, pastries and scones. I have many fond memories of the tea room, mostly having to do with the great little sandwiches we used to make. When the restaurant outgrew the location we were in and we moved, tea service was no longer the focus and was eventually phased out. This did not exactly break my heart, preparing for afternoon tea day in and day out had become a chore. But, I've had enough of a break from it to start missing it. Well, let me clarify- I don't miss serving tea, I just miss the food; specifically the tea sandwiches. I was talking to my friend Sharman last week about the tea room days, when she suggested I post about the tea sandwiches- (what a wonderful idea!) So in light of that, I will start a tea sandwich series, I hope you enjoy them as much as I do! It seems fitting the for the tea sandwich series to begin with the most classic tea sandwich of all- the cucumber sandwich. This is by far one of my favorites and I have been known to consume them in mass quantities. Like every other food I really like, it has it's rules: I like my cucumbers seedless and sliced velum paper thin. The bread must be white, soft and crust-less and the spread must be flavorful and savory. This is a sandwich I eat fairly regularly- with or without tea. The tea-less version I make for lunch is stacked with cucumbers and bread, while the Tea version is dainty and cut into shapes. 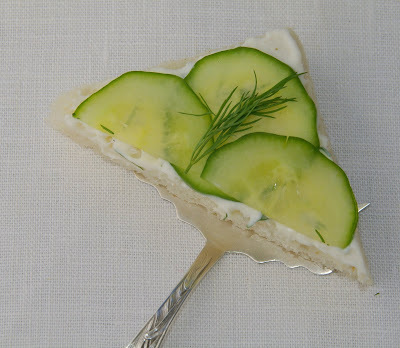 My most common use for cucumber sandwiches these days are for wedding and baby showers- just the right thing when I am looking for dainty food. When my roses are blooming I either garnish the platter or sandwiches with fresh rose petals. Tea sandwiches tend to dry out quickly, they are best eaten on the day they are prepared. I sometimes cut the bread and store it in a plastic bag until ready to assemble the sandwiches. 1. Remove crust from bread with a sharp knife and cut into shapes,triangles, squares, rectangles, hearts, or circles with cookie cutters. 2. Place creme fraiche, garlic powder, salt, pepper and 1 tablespoon dill in a small bowl- stir to combine. 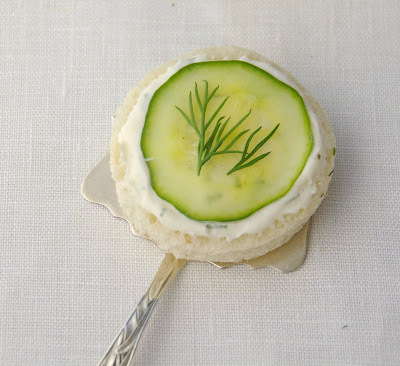 Spread lightly on bread, top with cucumbers and garnish with fresh dill sprigs. (Can be made up to 1 week ahead and stored in the refrigerator). 3. Cover with a damp paper towel until ready to serve to keep the sandwiches from drying out. Beautiful! I love all the different shapes! First, this is SO pretty. Second, thank you in advance for this series. I have long harboured fantasies of running the perfect little tea shop with tea sandwiches, mismatched china of all sorts, quiet sunny corners, and low soft voices chatting in quiet pleasure. I know the reality, however, would be that making hundreds of tea sandwiches, short cakes, scones, and curds would become a chore, perhaps detracting from the very calmness that led to the fantasy in the first place. Plus, it takes a special kind of person (abilty to stick to a consistent routine, tons of backbone and willingness to do backbreaking work and all the cleanup to boot) to cook and serve food for a living. Another reason I have this fantasy so often is that I'm not fortunate enough to live in a city with a proper tea room, so I visit them when I travel, and enjoy it so much. Perhaps it's time to just make a tea service for one or two, and start with some of your dainty sandwiches. I'll be watching this series with delight. so cute! i like preparing and eating tea sandwiches because it makes me feel british, which i desparately long to me. i'm hosting a scrabble party next weekend, and have been trying to plan a scrabble-friendly finger food menu. tea sandwiches are perfect! This brings back memories of all of the wonderful high teas we've had in London. My first experience with cucumber sandwiches was when my neighbor hosted a baby shower for me and the theme was high tea. I was instantly in love! I have since made them and my family loves them-great for a hot summer day! I love visiting tea parlors and having my own tea partys. In fact I just had one yesterday. First day if Spring. I will love your series and bookmark everyone. I even subscribed so I wont miss a single one!!! I've had tea sandwiches like these, except spread with butter, not creme fraiche. Creme fraiche sounds like a much better idea - more refreshing. Do you make your creme fraiche or buy it from a certain store? I sometimes buy creme fraiche at a store like whole foods or make it by adding a little sour cream to a pint of whipping cream, then allow it to sit out at room temperature all night. Your little tea room was my first formal tea -and cucumber sandwich- experience. Since then, no cucumber sandwich compares. I am delighted to have discovered your blogspot, and must tell you how since I have moved away, I have so missed your scrumptious restaurant fare. Particularly, I miss your mandarin chicken salad, dill shrimp pasta salad, and delicious chargrilled burgers. Your menu has been a gold standard in my own culinary endeavors to create flavorful comfort food that boasts a palette of color and texture. Thank you so much for sharing your tea sandwich recipes! I can hardly wait to come home to Baton Rouge and warm a seat in your sunny restaurant. Thank you, Rachel. I actually sold the restaurant about 2 years ago... but I'm working on a new project now. I will start when my non-compete expires in about a month. From what I hear the restaurant is not quite the same- but I was happy to read you enjoyed it so much while I had it. Thank you! Hi Katia, I'm just discovering your blog and it's wonderful. I'm planning on having a small bites buffet holiday party with small sandwiches, but not necessarily "tea sandwiches." Is there a heartier verison of the cucumber sandwich that isn't open face? Thanks! Hi GayG, thank you. As for the heartier version, I think layering paper thin cucumber slices between two pieces of whole grain wheat bread or a heartier white bread with the dressing would do just fine. If you have fresh dill I would layer it with the cucumbers. I would probably still cut the crust off, but you can do it either way. You might like the Moroccan carrot and goat cheese sandwich too- one of my favorites. You'll find it in the index. What would be the best substitute for Dill for garnish? I can't find fresh dill where l live. I can get fresh rosemary, fresh lavender, or green onions... or fresh parsely. What is your recommendation? Ohhh I feel like I've hit the Gourmet Jackpot! Everything sounds delicious! Ghosh! 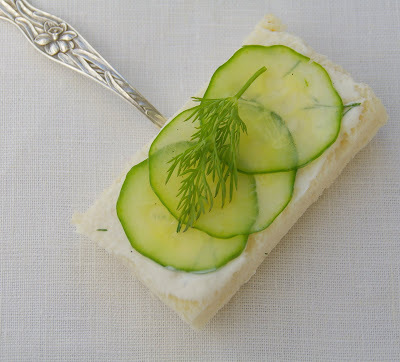 These are the loveliest cucumber sandwiches. In fact I am having a tea party this weekend. I am going to make this. I am making my shopping list right now :-)Thanks for sharing!